If you are a professional dancer! If you own a dance studio! If you are a dance instructors! If you are an active competitor! "First time I put them on, I danced all afternoon. They felt so comfortable, attractive and added much pleasure to my dancing." 08/2018 - Free priority shipping on all close out inventory orders over $70. We have built website for studio owners and teachers. Please contact us for the great referral programs. 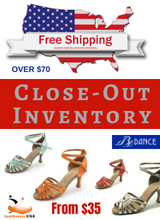 SoulDancer USA® dance shoes are expertly designed by Italian designers and combined with fine workmanship to provide full support and comfort to your dancing feet with the following characteristics: solid, sturdy, long-lasting and stylist. You also can design your dream dance shoes with more than 100 different colors and materials. Keep informed by our big sales, new styles, materials and colors.